Most of my backpacking has been in the mountains of Colorado and Wyoming, as well as the desert in the southwestern US. I�ve gone winter camping several times, but I still prefer backpacking in the warmer months. Most of my trips are 2-3 days, but I have taken several trips of 5-6 days. This past summer, I was fortunate enough to have thru-hiked the 476 mile Colorado Trail over 35 days. Recently, I have been leaning towards the lightweight side of the spectrum. Both of these Icebreaker garments are made out of 100% pure Merino wool. Attached to each garment was a small hang tag. Each tag gave information about the Icebreaker layering system, the source of Merino wool, care tips, and the benefits of Icebreaker garments. The benefits they list are: wears better, warms better, breathes better, smells better, and high UV protection. I received the Skin 200 Oasis Crewe in Diesel. As the name implies, the Oasis Crewe features a crew-neck. It is made with wool weighing 200 g/m2. According to the Icebreaker website, the Oasis Crewe "has a higher neck to trap in heat." I don't think the neck looks that much higher than other shirts I've seen. It also features flat seams designed to eliminate chafing. The BodyFit 260 Tech-Top that I received is Diesel/Shingle. The Tech-Top is made with slightly heavier wool, weighing 260 g/m2. Surprisingly, this difference is noticeable when handling the two garments. The Tech-Top features a zip-neck which covers the whole neck. According to Icebreaker it can be worn zipped down, zipped up, or zipped up and rolled down. 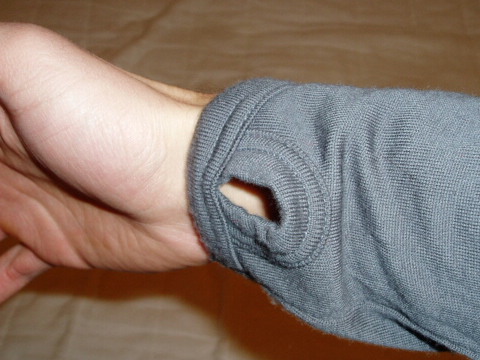 The Tech-Top also features thumb loops in both sleeves. Basically, there is a small reinforced opening at each cuff. 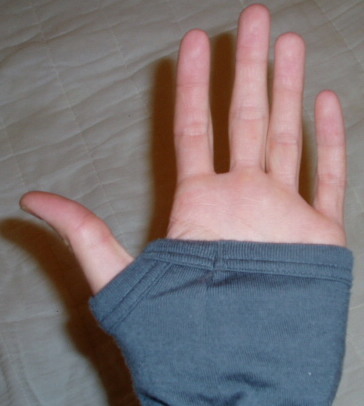 When the thumb loop is used, the sleeves cover approximately the bottom half of my palm. The Tech-Top has a dropped tail; the bottom edge of the back panel of the shirt extends approximately 2 in (5 cm) lower than the front panel of the shirt. It also features a small Icebreaker logo stitched onto the upper left chest. My testing will take place primarily in sub-alpine forests and alpine tundra on the Western Slope of Colorado. I would like to get one backpacking trip to the desert of southern Utah sometime this winter, but I don�t know if it will happen. The testing will take place at elevations ranging from 6000 ft (1800 m) to over 14000 ft (4300 m). I would estimate that the bulk of the testing will be between 9000 ft (2700 m) and 12000 ft (3700 m). Daytime high temperatures will likely range from 20� F (-7� C) to 60� F (16� C). Nighttime low temperatures could dip to -20� F (-29� C) or below, but I expect them to usually be between 0� F (-18� C) and 20� F (-7� C). I expect to experience a wide variety of weather. This could include sun, clouds, rain, snow, and possibly hail. Both of the Icebreaker Tops look and feel great. They are very soft and comfortable on my skin. I�ve worn each top twice and am already getting ideas of which top is best suited for various activities and conditions. So far, I�ve worn the Tech Top while ice climbing and skiing. 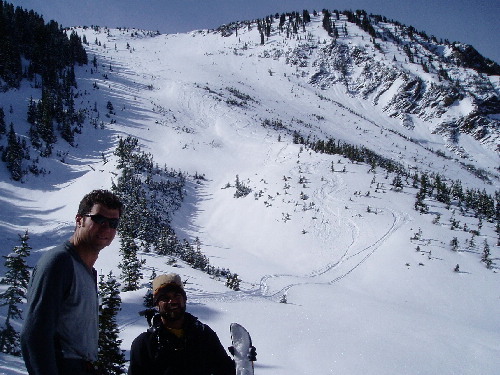 I�ve only worn the Oasis Crew while skiing. Based on the sizing chart on the Icebreaker website, I received a Large in both garments. They both fit slightly larger than I was expecting. I thought they would fit much more snugly; this was a nice surprise as I don't feel restricted when I wear them. The things that impressed me with both of these garments are the long sleeves and long torsos. 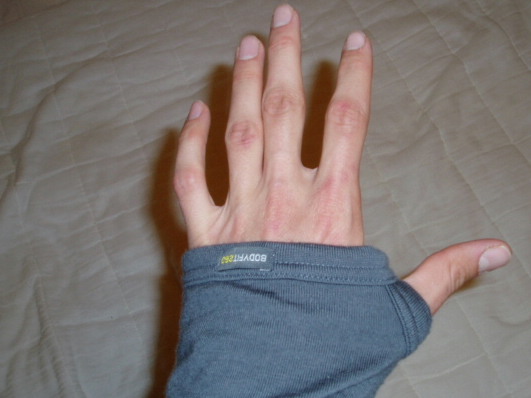 I have fairly long arms, and most baselayers I own are slightly too short in the sleeves, causing my wrists to become exposed when I reach overhead. I haven't had this problem with the Icebreaker tops yet. The same goes for the torso. The tops haven't come untucked from my pants, even while bending over to fiddle with my ski bindings or crampons, or while reaching overhead for a high ice tool placement. The thumb loops on the Tech Top are also a nice feature. I�ve only worn it while ice climbing, but it was good to know that there was no way the sleeves were going to slide down my wrists. Once I took my thumbs out of the loops, they cuffs stayed slightly stretched out for a time, but they eventually regained their shape. Warmth � How warm are these garments? Does the higher neck on the Oasis Crewe really seem to trap more heat? Will the zipper on the Tech Top make it easy to regulate my temperature? At what temperature will I start rolling up the sleeves or even switch to a lighter T-shirt? Fit � These shirts look like they fit fairly tight. Will they restrict any motion? Will the drop tail on the Tech Top keep the garment tucked in while climbing? Do the flat sewn side gusset and seamless underarm on the Oasis Crewe prevent any chafing? Does the Tech Top have anything similar? Durability � Will the wool snag? The care directions mention washing after several uses to remove �loose fibers.� How many fibers will work their way out? Will this be noticeable after several months of testing? Wicking Ability � How quickly will the merino wool move moisture away from my body? Will I quickly saturate the material when exerting myself, or will it always stay one step ahead. Will I get chilled at rest stops as the moisture evaporates? Stink � I can work up quite a sweat while playing outside. How well will the Icebreaker tops resist the accompanying odor? Will I be banished to the downwind end of the group when hiking with friends? Will I scare away small animals with my stench? How long will it take for these tops to smell? Will it be one day? One week? Most of my testing has taken place on the Western Slope of Colorado. I have also taken one long weekend hiking trip to the desert of southern Utah this spring. Testing has taken place at elevations ranging from 4500 ft (1400 m) to slightly over 12000 ft (3700 m). The bulk of my testing has taken place between 9000 ft (2700 m) and 12000 ft (3700 m). Daytime high temperatures have ranged from 20� F (-7� C) to 50� F (10� C). Nighttime low temperatures have ranged from 10� F (-12� C) to 30� F (-1� C). I have worn the Icebreaker tops in a wide variety of weather including sun, clouds, rain, and snow. I've worn either the Icebreaker Oasis Crewe or the Tech Top on every backcountry and resort skiing trip this winter. In addition, I've worn them several times while hiking, ice climbing, and winter camping. All in all, I've worn them nearly 30 times total. I've tried to alternate the tops for every day that I've been out (Tech Top one day, Oasis Crewe the next), but as I've gotten a better sense of how each top performs in various conditions, I've begun choosing them based on the conditions. I started gravitating towards the Tech Top in a wide variety of conditions. I really liked the zip-neck for venting. 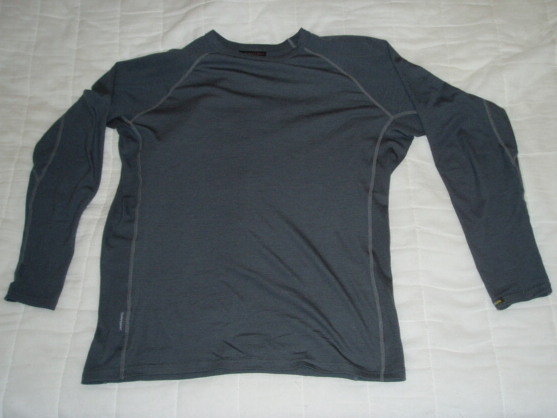 Before long, I realized that it was best as a baselayer in colder conditions. 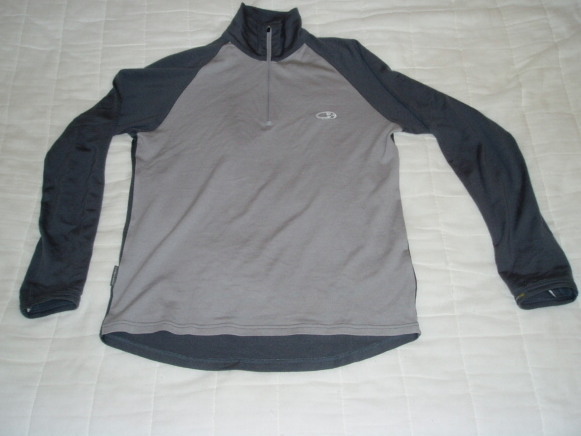 The zip-neck is nice, but the thicker wool made it too warm for aerobic activity in warmer weather. I prefer to use the Tech Top as a stand-alone top while skinning up mountains in the backcountry in cooler weather. If there is a strong wind, I'll add a wind shell to retain heat. For my descents, I'll add a hardshell jacket to protect me from the wind and those inevitable tumbles in the snow. The Tech Top layered under a softshell jacket has also proven to be ideal for resort skiing on cold days. It has also been my baselayer of choice while ice climbing. The thumb loops ensure that my wrists are never exposed to the elements and the thicker wool insulates me from the colder temperatures necessary for safe ice conditions. I've found that I don't like to use the thumb loops when skiing. I typically wear a watch while skiing to check time and altitude, and the thumb loops caused the Tech Top to cover my watch. As skiing gives way to hiking, I'll see if I use the thumb loops more often. The Oasis Crewe has proven invaluable for those warm spring days. I've found the Oasis Crewe to be ideal as a stand-alone top while skinning up mountains in the backcountry in warmer weather. As with the Tech Top, I'll throw on a wind shell if the breeze picks up. It's also been great for spring skiing at the resorts when layered with my softshell jacket. I used the Oasis Crewe while hiking in Utah, particularly in the morning and evenings. It's a very nice, lightweight top to throw on when the temperatures begin to cool. Both of these garments have been very good pieces. Given the weights of the tops, they provide a surprising amount of warmth. The zip-neck on the Tech Top adds even more versatility to its temperature range. As I stated earlier, the Tech Top is definitely more suited to colder weather due to the heavier wool. I've found that I typically start rolling up my sleeves when temperatures climb to around 45� F (7� C). The fit is definitely athletic, but comfortable. As I mentioned in my Initial Report, both tops fit slightly larger than I expected. After one washing, they seemed to have shrunk very slightly, even when following the care instructions. Regardless, I haven't felt restricted while wearing either of the tops. So far, these tops have proved very durable. They have shown little if any signs of wear. I haven't had any snags or pulls of the wool, and they still look great. As I mentioned, I have washed both tops once but haven't noticed any excessive shedding of loose threads. I've also been impressed with the wicking ability of these tops. I've worked very hard while wearing these tops, and have produced a lot of sweat. The tops have wicked the sweat away very quickly and in turn, the sweat has evaporated from the wool very quickly. I have saturated the material at times (particularly when wearing a pack), but I'm constantly impressed by how quickly the wool dries. I've found that I rarely get chilled during rest breaks, even when the tops are saturated. Generally, I'm working so hard in these situations that a cool breeze feels really good on my back. On a related note, these tops have yet to develop an odor. I wore them each approximately 4 times before the first and only washing. At that time, they didn't stink one bit. Since then, despite many days of hard work and sweating while wearing these tops, they refuse to stink! In fact, the only odor I've detected from them is a slightly "woolly" odor when I do saturate the tops. This odor isn't bad, just noticeable. Once the top dries, which is generally 10-15 minutes, the "woolly" odor is gone. So far, these Icebreaker tops have performed quite well. I'm anxious to see how versatile they are as temperatures rise and I spend more time on hiking trails and less time on skis. I'll continue to wear them as much as possible to see if any durability issues arise. I wore the Oasis Crewe on two hiking trips and the Tech Top on one hiking trip and one final backcountry skiing trip. Elevations on these trips ranged from approximately 8000 ft (2400 m) to 11700 ft (3600 m). Daytime temperatures ranged from 25� F (-4� C) to over 60� F (16� C). I experienced excellent weather on these trips. All four days were mostly sunny with only a light wind. These tops continue to perform very well. Again, they fit very well. I've never experienced any itching or discomfort while wearing either of the tops. Based on the thickness of the wool, both of these shirts seem better suited to cooler temperatures. I've found that I start wishing I had a short-sleeved shirt once the temperatures near 40� F (4� C) even if I have the sleeves pushed up and the neck unzipped (in the case of the Tech Top). A breeze will raise this temperature threshold to around 50� F (10� C). Both of these Icebreaker tops moved with me very well. They allowed me full range of motion whether it was shouldering my pack, reaching for my next pole plant, or swinging my ice tool above my head. The long torso on both of the shirts kept them tucked in most of the time. The only time they really came untucked was during skiing falls or really long reaches with my ice tools. Both of the tops wick moisture away from my body quite well. I never completely saturated the tops, even after a long, hard ski or hike. When the wool did get soaked, it always dried quite quickly, typically in 10-15 minutes. Despite the many days of hard use, they really haven't developed a smell. I never noticed much of a B.O. smell, even when wearing the shirts for several days in a row. Except for the one time that I washed the tops (back in late February), both tops would go into a ball in the corner of my closet after every trip, only coming out to accompany me on my next trip. Still no stink. As I stated in my Field Report, the only smell I noticed was a slight "wooly" smell when I soaked the tops. This smell disappeared as soon as the top dried. They have also proven to be quite durable. I've had other lightweight wool shirts that have begun to wear away at seams. Despite many days of hard use, I haven't noticed any visible wear on either of the shirts. Overall, these are awesome tops. They will continue to be my go-to cold weather tops. They will also come along on my backpacking trips when nighttime temperatures drop. I've used several wool base layers before, and these are by far my favorites. Thank you to Icebreaker and BGT for giving me the opportunity to test these tops.